Alsie Fleetwood OSWALT [Parents] was born on 22 Jan 1884 in , Fayette, Alabama. He died on 5 Feb 1963 in , Tuscaloosa, Alabama. Alsie married Bertha Flora FOWLER on 5 Feb 1913 in , Fayette, Alabama. Bertha Flora FOWLER was born on 9 May 1887 in , , Alabama. She died on 23 Apr 1965 in , Tuscaloosa, Alabama. Bertha married Alsie Fleetwood OSWALT on 5 Feb 1913 in , Fayette, Alabama. John SNOW "Sr" [Parents] was born on 8 Apr 1841 in , Green, Missouri. He died on 31 Mar 1902 in Pekin, Tazewell, Illinois. He was buried in Union Army Camp Cemetery, Galloway, Missouri. John married Nancy J. LEE. Nancy J. LEE was born in Oct 1841 in , Meigs, Tennessee. She died in 1923 in , Greene, Missouri. Nancy married John SNOW "Sr". Edward SNOW was born in 1865 in , , Missouri. F iv Margarette A. SNOW was born in 1867. She died on 9 Aug 1899. F v Amanda Elizabeth SNOW was born on 11 Oct 1868. She died on 3 Jun 1913. M vi James M. SNOW was born in 1871. He died in 1953. M vii John SNOW "Jr" was born in 1874. M viii George R. SNOW was born on 30 Aug 1875. M ix Fred Ambrose SNOW was born on 7 Oct 1879. He died on 22 Nov 1960. Michael GUIN was born about 1795. Michael married Elizabeth ANDREWS. Elizabeth ANDREWS [Parents] was born in 1797 in , Laurens, South Carolina. She died in 1798 in Tuscaloosa, Tuscaloosa, Alabama. Elizabeth married Michael GUIN. Vernon MOSES. Vernon married Peggy. Peggy. Peggy married Vernon MOSES. F i Lisa Ann MOSES. F ii Ann Marie MOSES. F iii Lori MOSES was born on 3 Nov 1971. Danny WILSON. Danny married Rebecca Jean CABLE. Rebecca Jean CABLE [Parents] was born on 12 Dec 1956. She died on 15 Apr 1994. 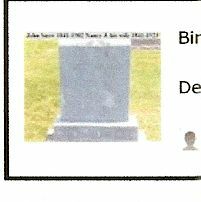 She was buried in Memorial Park, Norman, , Oklahoma. Rebecca married Danny WILSON. CLARK. CLARK married Pena CULBERTSON. Pena CULBERTSON was born in 1813 in , Marion, Missouri. Pena married CLARK. 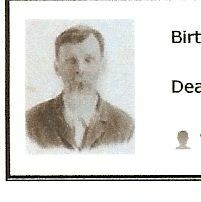 William F. BROOKS [Parents] was born about 1842 in Dist. 21, Dade, Georgia. William married Mary Ann UNKNOWN about 1837 in , , Tennessee. Mary Ann UNKNOWN. Mary married William F. BROOKS about 1837 in , , Tennessee. Thomas COKER. Thomas married Frances. Frances. Frances married Thomas COKER. F i Mary Frances COKER was born on 24 Jan 1932. Grady M. BURRESS. Grady married Sarah Mac "Sallie" KUYKENDALL. Sarah Mac "Sallie" KUYKENDALL [Parents] was born in Jun 1893 in , Haywood, North Carolina. Sarah married Grady M. BURRESS. Marvin YOUNG was born on 8 Mar 1930. Marvin married Wilma June LAKE. Wilma June LAKE [Parents] was born on 4 May 1940. Wilma married Marvin YOUNG. F i Alesia YOUNG was born on 14 Nov 1966. M ii Mitchell Marvin YOUNG was born on 15 Jul 1970. F iii Cindy Elizabeth YOUNG was born on 15 Jan 1973.